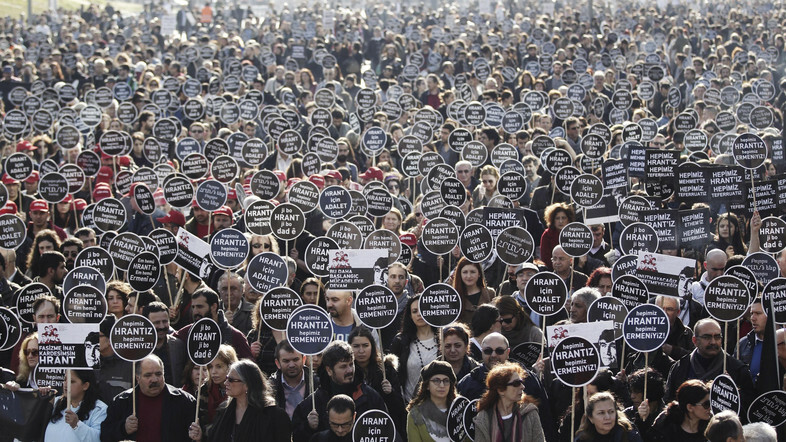 Several thousand people take part in Istanbul rally to mark anniversary of Hrant Dink’s killing and demand justice. Several thousand Turks have taken part in a rally, amid heavy presence of riot police, to demand justice for a prominent Turkish Armenian journalist murdered seven years ago. A demonstration has been staged every year on January 19 since Hrant Dink’s murder. It has often turned into a general plea for justice. “Murderer state will account for this,” chanted the protesters who had gathered on Sunday in Istanbul’s Taksim Square. Questions still linger about the circumstances of the killing. Dink, 52, a leading member of Turkey’s tiny Armenian community, was killed by a teenage ultranationalist outside the offices of his bilingual Agos newspaper on January 19, 2007. He had campaigned for reconciliation between Turks and Armenians, but incurred the wrath of Turkish nationalists for calling the mass killings of Armenians during the first world war a genocide. Dink’s supporters believe that those behind the murder were protected by the state and have asked for a deeper investigation to uncover officials who were allegedly involved. Backing up widespread accusations of a state conspiracy, a former police informant accused of instigating the murder claimed during his trial last month that he had warned police of the plot but they failed to act. Dink’s self-confessed murderer, Ogun Samast, a 17-year-old jobless high-school dropout at the time, was sentenced to almost 23 years in jail in 2011. Sunday’s rally came as the Turkish government battled fresh protests in the wake of a corruption scandal involving the closest allies of Recep Tayyip Erdogan, Turkey’s prime minister. On Saturday Turkish police fired tear-gas and plastic bullets to break up a protest by around 2,000 people over controversial plans to impose curbs on the internet. Turkey has long been criticised for a lack of freedom of expression and has been branded the world’s top jailer of journalists. Dozens of journalists are in detention, as well as lawyers, politicians and legislators, most of them accused of plotting against the government or having links with the outlawed Kurdistan Workers’ Party (PKK). Thank you for this. I hope you do not mind that I have reblogged this. I wouldn’t mind at all of course. Thanks for your interest. I feel the same about your blog- and I hope to write about it and/or individual posts in the near future which greatly interest me. Cheers!